Flova bathroom taps and showers have launched into the UK market with Pura Bathrooms, they have been around in the world of bathrooms since 1991 but not until now have they been in the UK market. What does Flova UK offer, well I can say quality at a very competitive price, most of the ranges were in Pura Bathrooms book before now with the likes of STR8 and best selling Levo range so I am not quite sure why the decision was taken to move them over to another brand name, the only reason I can think of is that Pura wanted to have Pura Bathrooms which sells other bathroom products and Flova as a dedicated brass ware supplier. 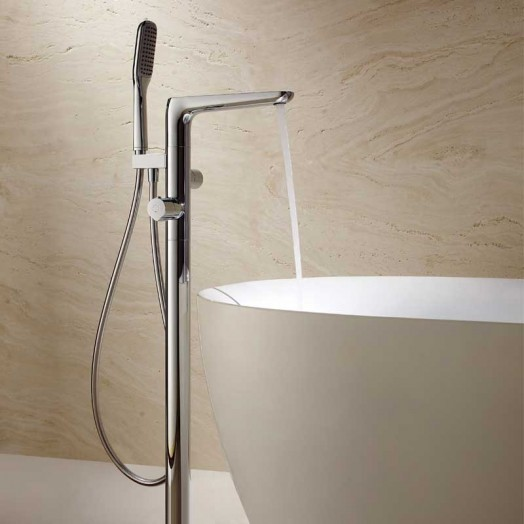 Looking at the Allore range in particular and it’s freestanding bath shower mixer, well all I can say is it is stunning! and so to is the Allore shower column with its handset, Large drenching shower head, and 3 body jets. Allure is not a huge range but there are enough items in the range to satisfy most bathrooms. To see more visit Flova Uk.